Learn about the WS-Security Symmetric Binding Policy. The WS-Security Symmetric Binding Policy provides support for the Symmetric Binding Assertion. When a symmetric binding is used only one party needs to generate the security tokens. A symmetric key is established using that security token and additional signing and encrypting is performed using this token. For example, symmetric binding can be used when only the server possesses an X509 Token. In this scenario, the initiator first creates a temporary key and then creates an encrypted key and encrypting the temporary key using the recipient’s public key. This temporary key is then used for both signing and encrypting messages back and forth. This mechanism allows a service to sign and encrypt messages even with an anonymous client. If a service wants to authenticate its clients, this can be accomplished using supporting tokens. Symmetric binding defines three token properties: Protection Token, Signature Token, and Encryption Token. If the same token is used for signature and encryption, the Protection Token can be used. Otherwise, you can use separate Signature Token and Encryption Token properties. In the second panel, click Modify to access the Modify WS-Security Symmetric Binding Policy wizard. In page 1, Specify Symmetric Binding Options, enter values for the binding options. For details about fields and values, see Specify Symmetric Binding Options below. Token Type: Choose a token type. Choices: X.509, Binary Security, SAML, Kerberos, Username, Issued Token, Secure Conversation, or Spnego. Token Inclusion: Allows you to specify an IncludeToken attribute in the message. Choices: Not Specified, Always, Always to Recipient, Once, or Never (Indicates that an external reference mechanism is used to refer to the key represented by the token). Subject Category: The subject category for the token. Choices: Consumer, End-User, or User Defined. For user-defined, specify the value. Specify X.509 Token Options: For details, see Tab 3-1: Specify X.509 Token Options below. Specify Binary Security Token Options: For details, see Tab 3-2: Specify Binary Security Token Options below. 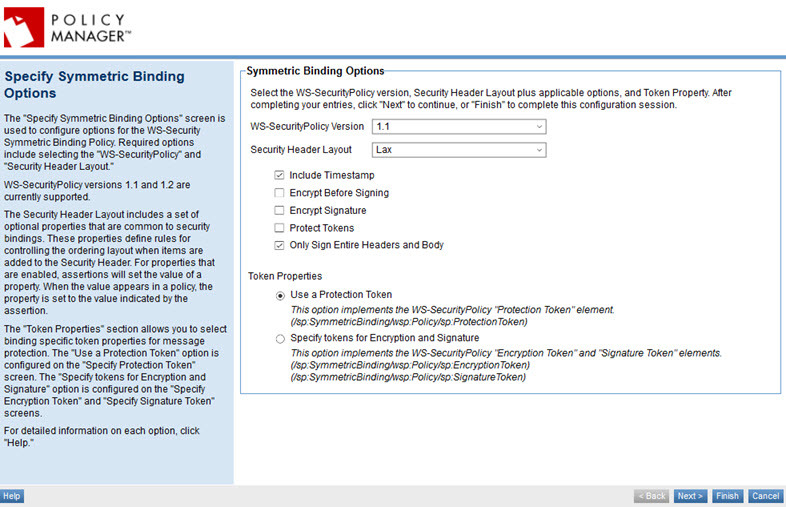 Specify SAML Token Options: For details, see Tab 3-3: Specify SAML Token Options below. Specify Kerberos Token Options: For details, see Tab 3-4: Specify Kerberos Token Options below. Specify Username Token Options: For details, see Tab 3-5: Specify Username Token Options below. Specify Issued Token Options: For details, see Tab 3-6: Specify Issued Token Options below. Specify Secure Conversation Token Options: For details, see Tab 3-7: Specify Secure Conversation Token Options below. Specify SpnegoToken Options: For details, see Tab 3-7: Specify Spnego Token Options below. In page 4, Configure Security Algorithm, specify required elements and namespace prefixes. 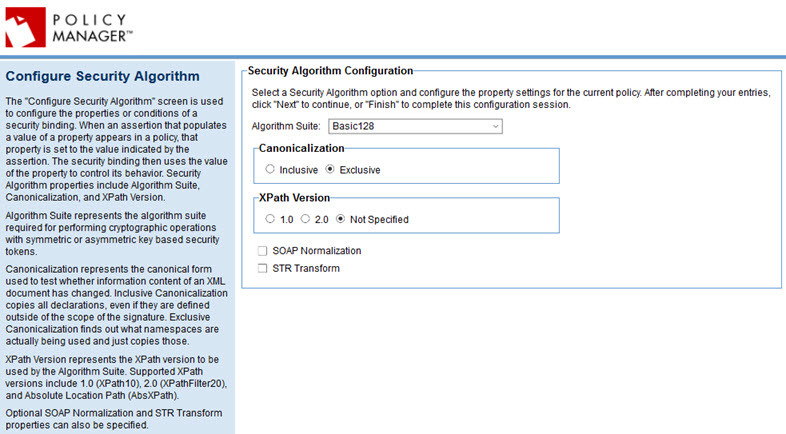 For details, see Tab 4: Configure Security Algorithm below. In page 5, Specify WS-Security 1.0 Options, specify security options. For details, see Tab 5: Specify WS-Security 1.0 Options below. In page 6, Specify WS-Security 1.1 Options, specify security options. For details, see Tab 6: Specify WS-Security 1.1 Options below. In page 7, Specify WS-Trust 1.0 Options, specify trust options. For details, see Tab 7: Specify WS-Trust 1.0 Options below. In page 8, Specify Security Audit Options, specify audit options. For details, see Tab 8: Specify Security Audit Options below. The Specify Symmetric Binding Options page includes the options listed below. Allows you to select from a set of optional properties that are common to security bindings. These properties define rules for controlling the ordering layout when items are added to the Security Header. For properties that are enabled, assertions will set the value of a property. When the value appears in a policy, the property is set to the value indicated by the assertion. Checkbox indicating whether a timestamp must be provided. Checkbox indicating whether encryption must be performed before signing. Checkbox indicating whether the signature must be encrypted. Checkbox indicating whether the primary tokens of the message must be protected. Checkbox indicating whether the signature must cover the headers and body in their entirety instead of only portions. You can choose either Use a Protection Token option (configured on the Specify Protection Token page) or Specify tokens for Encryption and Signature (configured on the Specify Encryption Token and Specify Signature Token pages). The Specify Protection Token page includes the options listed below. Token type. Choices: X.509, Binary Security, SAML, Kerberos, Username, Issued Token, Secure Conversation, or Spnego. The next page of the wizard is custom to the selected token type. Allows you to specify an IncludeToken attribute in the message. Choices: Not Specified, Always, Always to Recipient, Once, or Never (Indicates that an external reference mechanism is used to refer to the key represented by the token). The subject category for the token. Choices: Consumer, End-User, or User Defined. For user-defined, specify the value. The Specify X.509 Token Options page includes the options listed below. A drop-down list box that allows you to select the Version of the X.509 token types that can be configured. The URI of the authority in a network that issues and manages security credentials and public keys for message encryption (for example, Certificate Authority). Optional. A Token Reference is used to ensure a consistent processing model across all the token types supported by WSS: SOAP Message Security. The <wsse:SecurityTokenReference> element is used to specify all references to X.509 token types in signature or encryption elements that comply with this profile, and can reference one of the listed X.509 token types. Each option is selected by clicking a checkbox. This option uses the <wss:KeyIdentifier> element to specify a reference to an X.509 certificate by means of a reference to its X.509 SubjectKeyIdentifier attribute. If a Key Identifier is specified without a ValueType it will be interpreted in an application-specific manner. This option uses the <ds:X509IssuerSerial> element to specify a reference to an X.509 security token by means of the certificate issuer name and serial number. This option uses the <wsse:Embedded> element specified within a <wsse:SecurityTokenReference> element to create a reference to an embedded token. This option is a Key Identifier ValueType is used to specify a reference to an X.509 certificate by means of a reference to its X.509 Thumbprint attribute. Allows you to specify a Derived Key—a key management scheme in which for every transaction, a unique key is used which is derived from a fixed key. Note that WS-Security Policy Version 1.1 and 1.2 support different Derived Key options. After completing your entries, click Next to go to the Configure Security Algorithm page. See Tab 4: Configure Security Algorithm. The Specify Binary Token Options page provides options for configuring a Binary Token Assertion Type. This token type encoding is defined by configuring the @ValueType and @EncodingType attributes of the <wsse:BinarySecurityToken> element. The ValueType attribute allows a URI that defines the value type and space of the encoded binary data. The EncodingType attribute tells how the security token is encoded. The default value is Base64Binary and is currently the only value supported by WSS SOAP Message Security. The Specify SAML Token Options page includes the options listed below. Specify the key management scheme in which, for every transaction, a unique key is used which is derived from a fixed key. Note that WS-Security Policy Version 1.1 and 1.2 support different Derived Key options. The Specify Kerberos Token Options page includes the options listed below. Allows the <wss:SecurityTokenReference> to reference the <wsse:KeyIdentifier> element. Allows you to specify a Derived Key—a key management scheme in which for every transaction, a unique key is used which is derived from a fixed key. The Specify Username Token Options page includes the options listed below. The Specify Issued Token Options page includes the options listed below. Specify either the name or the address (URL) of the Certificate Authority. Indicate whether derived keys are required, or there are none. Determines whether an external reference is required when referencing this token. The reference will be supplied by the issuer of the token. Determines whether an internal reference is required when referencing this token. The reference will be supplied by the issuer of the token. The Specify Secure Conversation Token Options page includes the options listed below. Determines whether the URI used by a Security Context Token (SCT) will be externally referenced. Determines whether references to Security Context Tokens (SCT) in messages must use an external URI. The Specify Spnego Token Options page includes the options listed below. Indicate whether derived keys are: Explicit, Implied, Both, or None. For more detailed information about the algorithm suites, see Supported WS-Security Algorithm Suites.